The conventional answer is yes, yes they did. In fact a quick web search will reveal any number of web sites touting this or that Neanderthal burial. They were almost human, they had stone tools and other implements of human culture, they were clearly human enough to mourn their dead. Apes, dolphins, and elephants mourn their dead. Neanderthal skeletons have been found in what appear to be graves, what’s the problem? The problem is that some academics with excellent credentials challenge the view that Neanderthals deliberately buried their dead in the manner of humans. The claim is that because we bury our dead in a ritualistic fashion, we have projected that behavior onto the scant evidence that exists for Neanderthal burials. The is the Amesbury Archer. Pretty hard to call that anything but a grave. There is no comparable Neanderthal site. Some of their graves might have had flowers and such buried with the body, but even that is debatable. A few did have a few grave goods, but again, it’s debatable. Worse, much worse in my opinion, there isn’t even a Neanderthal grave where it is clear a hole was dug, the body placed inside, and the hole refilled with the dirt from the hole. 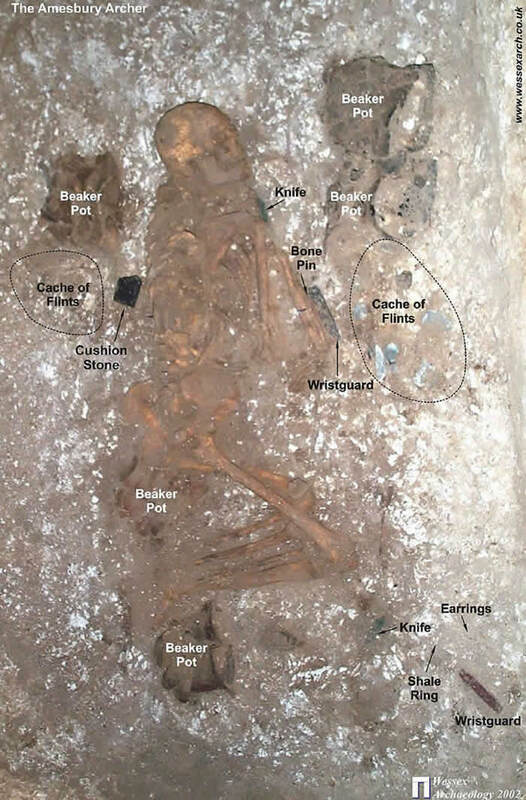 In what cases were properly investigated (archeology has made a lot of progress since the 19th century,) the bodies appear to have been placed in natural depressions, and the dead weren’t always completely buried. Well, what does it matter? It matters because scientists are trying to answer the age old question, were Neanderthals human? IE could a typical Neanderthal have learned English and conversed with us? I’ve blogged about the Neanderthal speech debate here. If Neanderthals buried their dead as humans do, wouldn’t this mean they also believed in an afterlife of some sort? At the very least it would seem to indicate an understanding of individuality and life and death in a way that humans do. That’s the argument as I understand it, and the majority of Neanderthal researchers find it reasonably compelling. The counter argument? The Neanderthals may have been simply disposing of the bodies. Aside from the smell, they would attract carnivores and scavengers. The picture is also muddied by the fact that Neanderthal skeletons have been found with marks where meat was carved from the bone. Cannibalism or ritual defleshing? No one knows. It’s also possible that the burial-like Neanderthal “graves” that have been discovered might simply have been Neanderthals mimicking their far more successful cousins, Homo sapiens, with no clear intent other than a vague idea that copying what they do might lead to more success for their hunts. Of course this gets into another muddy area, why did the Neanderthals eventually get wiped out when they came into contact with Homo sapiens? Current thinking, which is by no means definitive, is that they simply couldn’t compete with Homo sapiens much more sophisticated hunting and food gathering abilities. In any event there’s no overarching point to this post, other than to point out that what we know about our closest known cousins in the human lineage is still subject to debate. And while the current consensus is that Neanderthals were humans (speaking figuratively,) it’s by no means cut and dry. Complicating the debate about Neanderthal cognizance even further, they had bigger brains than humans. Yet somehow their tool use remained rather simple and primitive right up to the very end. And then of course there is the messy business of humans and Neanderthals breeding with each other. Most people alive today have some Neanderthal genes, and we didn’t get them through cannibalizing Neanderthals. What was up with that? Maybe someday, a post on recently discovered Neanderthal art as a follow up to this post about a Neanderthal “sculpture.” More posts on weird weapons of war are definitely coming up. And no, not a single person caught the smurf reference joke. I will not be posting about smurfs. Interesting post Doug, I also like the article you linked at the bottom of the post. Throwing a carcass in a hole and covering it partially with existing debris does sound more like ridding oneself of a dead decomposing body then an actual burial. Then again I’m not sure what that proves, I think it would be possible not to “properly” bury a body and still mourn the loss. The mixed breeding thing is intriguing, from the limited amount of material I have read on the subject it seems culture wise Homo Sapiens and Neanderthal were quite different in levels of social sophistication at that time. I wonder if Neanderthals were ever adopted into Homo Sapien social circles, or even vice versa. May I suggest a post on confirmation bias? Brother, in regard to the Amesbury archer link, I laughed out loud at the description of the original owner of the skeleton who was described as having had his left knee cap ripped off in an accident some years prior to his death. Sometimes I think modern interpretations of scant physical evidence (All archeology ever) are ludicrous at best. But what do I know? Anyways, your inclusion of the Amesbury archer as evidence to say ‘we know homo sapiens buried their dead’ (perhaps he was just some poor schmuck cowering in his bomb shelter before dying of a pulmonary embolism…a condition exacerbated by the aforementioned forcible removal of his patella) but there is no evidence that neanderthals did so because no such grave has ever been found, is a logical fallacy. (I have studied logical faults on many occasions and admit I am grossly lacking in sufficient intellect to even begin to wrap my mind around the sheer volume and diversity of illogic that riddles human communication.) I cannot define your logical fallacy more accurately because, as I mentioned, I lack the intellect to categorize it and thereby call it by its Latin name, but Neanderthals lived 30,000 years ago and the Amesbury archer died like 3500 years ago. So it is not surprising to this reader that we haven’t found a real grave grave from a minimum of 30,000 years ago, but have found one from 3500 years ago. I think you mentioned that some Neanderthals had been found in ‘natural depressions’…imo that is what might happen to a grave in 30,000 years. Just sayin’. I hope I haven’t grossly misinterpreted what you were saying in that paragraph. That would be embarrassing. I think they ate their dead. Eventually prion diseases killed them off…but not before our predecessors mated with them. I THINK IT IS REAL THAT THERE WERE NEANDERTHALS, AND THAT IT (THAT PERSONS TURNED LOOKING “NEANDERTHAL”) WAS/ IS CAUSED BY HAVING TO FIGHT BACK EXTREME VAMPIRES / DEMONS AS THIS IS THE ONLY BODY-FORMAT ONE CAN COMBAT THEM WITH, AS A / AN ORIGINAL BATTLE IS / WAS LOGGED IN THE PAST, AND IS A ONE OF KIND BATTLE, AND CAN ONLY BE FOUGHT FROM THAT TIME.. “AND IN THAT WAY”!